We worship on the Fifth Sunday after the Epiphany at 8 and 10 a.m., and we worship thanks to the gracious youth of St. John’s (truly the “light of the world,” as Jesus says in Matt. 5, which we’ll hear proclaimed on Sunday). 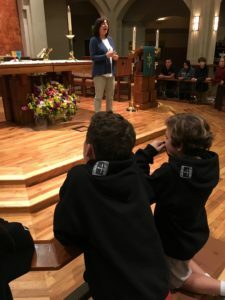 Youth ministers will perform every liturgical function for which the church doesn’t require a priest (which is more functions that you might think!). Your preacher, high school senior Adam Lang, has prepared thoughtful biblical, historical, and personal reflections that you won’t want to miss. The photo shows youth leader Patti Peebles on Wednesday evening, after Youth Eucharist and before our youth ministers’ final rehearsal. Please give thanks in your prayers for their hard work and faithful witness! It’s also (Girl and Boy) Scout Sunday at St. John’s. We invite all present and past Scouts and Scout leaders, in or out of uniform, to come forward at the end of the 10 a.m. service for the annual Scout prayer and photo opportunity. Scouts in uniform are invited be at church by 9:45 a.m. to assist ushers and greeters in welcoming worshipers to St. John’s. Look for our Boy Scouts after church, too. They’ll offer subscriptions to come put the U.S. flag on your lawn on three upcoming patriotic holidays. How cool is that? Also this weekend, you’ll want to bring your food gifts for the first-Tuesday Rancho Santa Margarita food pantry (and let pilgrim Roger Bradshaw know at parisbradshaws@me.com or (949) 505-4663) if you can volunteer anytime between noon-5 p.m.). And please sign up to bring a potluck item for next Sunday’s (Feb. 12) post-annual meeting luncheon and ministry fair. And mark your calendars for the St. John’s School gala dinner, “STEAM Into the Future,” on Saturday, March 4. Proceeds will support technological enhancements in the classroom, library improvements, and other program upgrades that are making our Episcopal school the most innovative in the region. P.S. 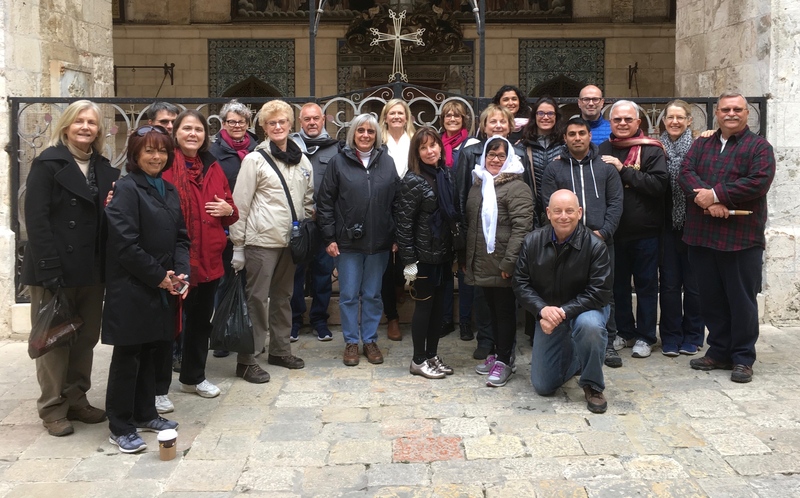 : Here are your 2017 St. John’s Holy Land pilgrims, who arrived home safely on Tuesday morning, during their visit last week to the Armenian Orthodox Patriarchate in the Old City of Jerusalem. (That’s the kind of reference that just rolls off your tongue once you’ve become a pilgrim!) Missing from the photo is pilgrim Jay Murray.